Michael met up with Lucas G. (aka, Connor, the Clex Baby!) at the bowling alley. Is Lucas wearing a Supes shirt under the plaid? Next week is the Sundance Charity Hockey Game so we might get a few Michael-pics! And he actually looks like a possible blend of Michael & Tom, so it works! That kid was perfect for this role. It's great to see them hanging out. Michael looks wonderful! I like Lucas. He's a gifted actor (and singer), and like Michael, he seems genuine and down-to-earth. I watch his current show, Switched at Birth. I'm holding out hope that Tom shows up at Sundance this year. And runs into Michael. In front of a photographer. And the frenzied man-hugging goes on for hours, yes please! It would be wonderful if Tom went. Seems like an age since we had a new photo! That's one of the things I like about Sundance, it's crawling with photographers. Even Tom with his superior ninja skills would be hard-pressed to escape all of them. It makes perfect sense (to me) for Tom to attend, but who ever knows what he's going to do? I'll keep my fingers crossed! Tom seemed to have a good time the last time he went (2008?) If he's working out again, hopefully that means we'll get at least the hint of a project to tide us over! Heh, maybe Tom handles the horseback riding and golfing part of ClexBaby's education! Ooh, I feel like jumping up and down and saying "pick me, pick me" for their bowling team, LOL. Love the plaid shirt, haha. And yep, it's nice to see Tom and Mike 'sharing custody' haha. I bet both Lexes are excellent bowlers! That definitely looks like a Superman shirt Lucas has on too. hee! It's awesome that they hang out like that. And that they both look so adorable. It's a shame they never had a scene on the show together but it's great to see a candid shot. And Michael's lightning bolt is reminiscent of Flash! Wouldn't it be sooooo much fun watching Michael bowl? He probably jumps all over the place when he makes a strike, the cutie. *lol* So cool! (and cute)! Lex & Lex, just chillin'! Awwww! That is so darn cool!!! Aww it's cute that they hang out together. Love the 'sharing custody' idea, heh! They do look like they are both wearing superhero-y T-shirts as well! Aww, that's so sweet that they hang out together. I keep waiting for Tom to pop up in the background. LOL. And I think he is wearing a supes shirt. 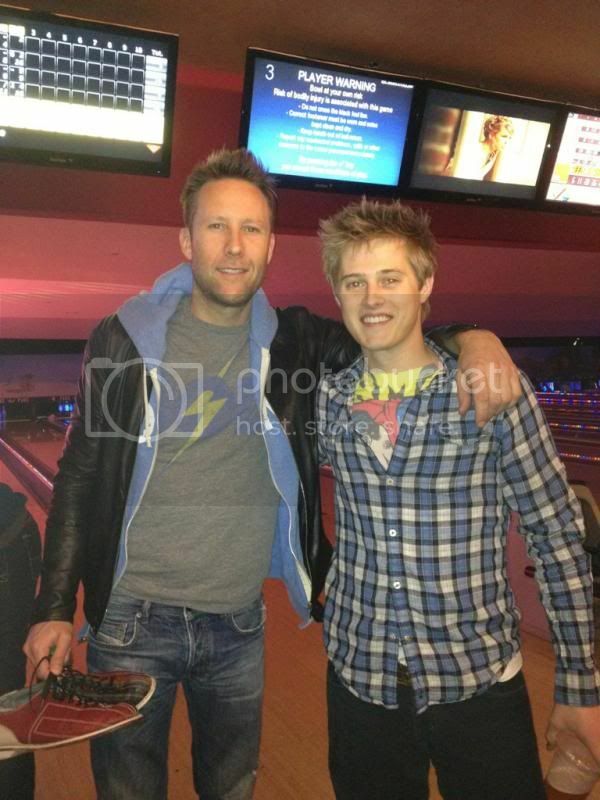 Looks like Lex is going to have to take him bowling more if he wants him to not join the League ;). Wouid love if Lex's latest Evil Plan centered on bowling! I keep waiting for Tom to pop up in the background. How amazing would that be? I think the internet would implode! I love it. Thanks for posting it! Now the question is which bowling alley they're at. If it's Lucky Strikes at Hollywood & Highland, that's the same place Brandon Routh worked before he got famous. I'm going to six degree to separation this to death! Ooh, cool! Michael is also in a short film with Brandon called "Cost of Living" which will be out on Feb 14 - hope they have a scene together!